This section covers one of the best systems that Silicon Graphics ever put out. 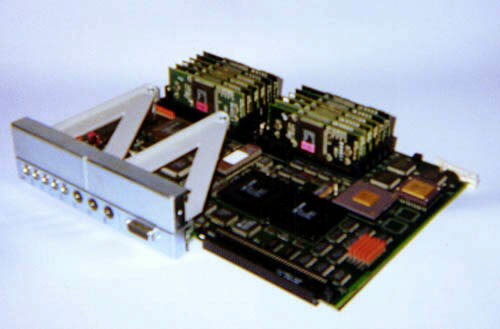 The IRIS Indigo pulled Silicon Graphics to the front of the image workstation market in both price and performance. The high end model (R4000 processor and 24-bit graphics with a single geometry engine and z-buffer) was unmatched in performance, and was used in such movies as Jurassic Park and Toy Story as 3-D modeling workstations. 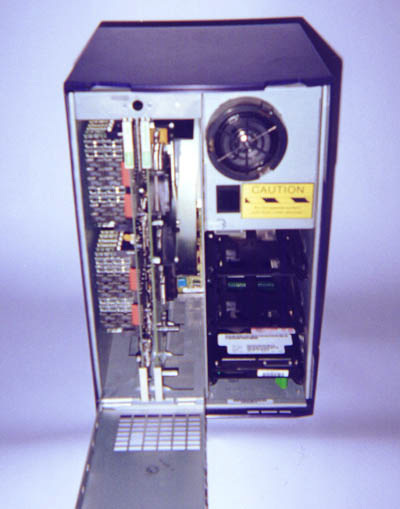 The entry level model (R3000 processor and 8-bit graphics) was in direct competition with Apple's top of the line Quadra 950 computers in both price and performance. 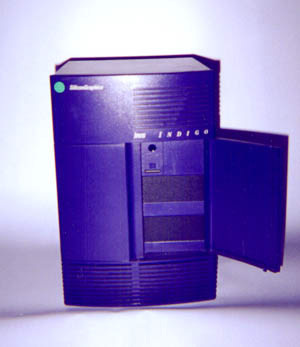 Though slightly faster than the Quadra 950, the Indigo R3000 was not nearly as expandable as the Quadra. Plus the lack of software gave the Quadra the advantage as a graphics workstation, but the Indigo was still an amazing system. The Indigo was also a beautiful piece of equipment just to look at. It was a marked improvement over the Personal IRIS series (which were short on looks and very heavy). The Indigo has three drive bays, two of which have openings behind a small door (as seen here). 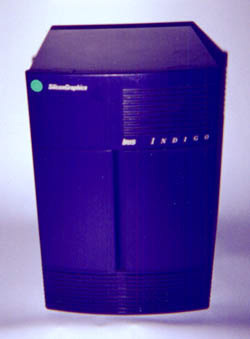 Unlike PC of the same period, the Indigo was design with sound built-in for mpeg's or audio editing. It's speaker can be seen once the front panel has been removed. The R3000 models logic board pulls out completely for easy installation of more RAM (up to 96MB). So here we are eight years later. Are these really worth anything now in the age of GHz? Actually yes. Even though the R3000 models are not supported for Irix 6.x, they do run Irix 5.3 which is not that different from the newest version. 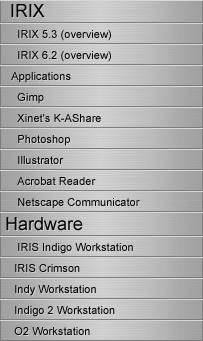 This makes an inexpensive Unix workstation to learn on, and a nice imaging workstation with the installation of GIMP! When running side by side with my Indy running Irix 6.2, you would have a hard time telling which OS was which (infact I originally had Irix 5.3 on my Indy as well). Also with drive prices coming down, this system would make a great file server for small networks (specially a Mac network by using Xinet's K-AShare). The other nice thing about the entry level IRIS Indigo is that the graphics board supports standard PC monitors (you can get a nice 17" color monitor for as little as $100.00). For those of you saying "I can use a system with only 8-bit graphics", the graphics board has a hardware dithering that allows the system to run applications that require 24-bit graphics. The actual displayed color space looks more like 16-bit (there is a trade off, the hardware uses processor cycles to help display this many colors, and with processor intensive application there is some slowing), but this was about to keep the cost down. 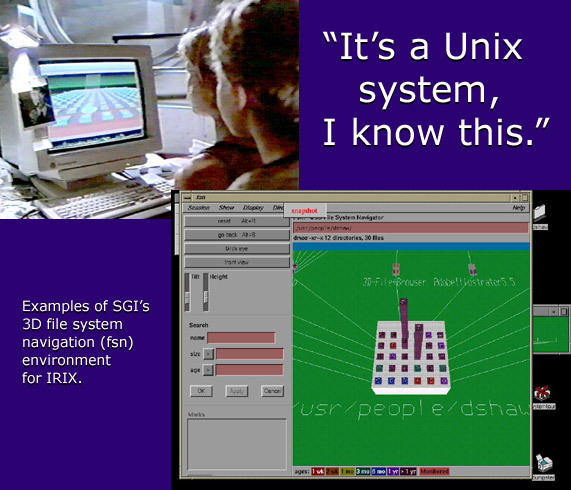 The version of IRIX which I'm using on my Indigo, IRIX 5.3, is the last of that supported the 3D file system natigation (fsn) displayed in the movie Jurassic Park. Of course I guess you can tell the little girl comes from a rich family if she has her own Silicon Graphics computer in the early 90's.